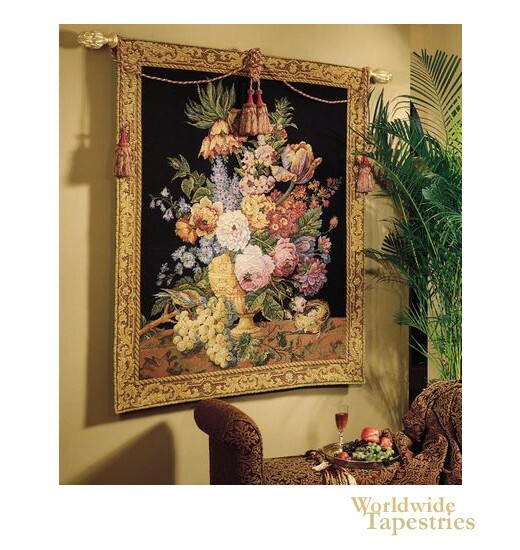 Floral & Bird Black tapestry shows a floral scene based on the art of Jan Davidsz de Heem from the 1600s. The famous Dutch painter (1606-1684) produced wonderful floral still lifes in Flemish Baroque style. Here in this floral piece we see colorful blooms and fruit on a table. The colors are varied and produce an extravagant piece where the bird perched on the fruit, and a small birds nest also helps portray the beauty of nature to its utmost. This still life floral tapestry "Floral & Bird Black" is backed with a lining and has a tunnel for easy hanging. Note: tapestry rod and tassels, where pictured, are not included in the price. Dimensions: W 50" x H 59"